We all know that Proust could conjure worlds by dipping his famous madeleine in a teacup. I found that listening and talking with mystery writer Cara Black, creator of the unstoppable, smart and thoroughly modern detective Aimée Leduc, had the same effect on me. Hearing Black’s memories, and wandering the shadowy streets and dark underbelly of Paris with Aimée, sent my own memories wandering too. Black regaled an audience of Left Coast Writers recently with how she first arrived in Paris as an eighteen-year-old wearing a lumberman’s jacket and boots and boldly went unannounced to knock on the door of celebrated writer Romain Gary. Since he had politely responded to a fan letter she’d written him, she figured he’d be happy to see her. My own first moment was also tinged with the ridiculous. Like Black, I had hitch-hiked all over, so for my arrival at age nineteen, my transportation was by large truck. Joining the affable truck driver. in smoking Gauloises, I decided I needed to look chic for my grand entrance in the City of Light. So I added a skirt, hose and heels to my ensemble -- much enhanced I’m sure, by a battered suitcase. I asked Black if, upon arrival, her French was actually up to the task of speaking with Romain Gary. She laughed and said her schooling with French-speaking nuns had given her a fluency and vocabulary that was vintage end-of-nineteenth century. In that respect, I can match and raise her one. By the time I arrived, I had taken so many French lit. classes, and devoured so much grammar, that a Parisian friend joked she loved getting my letters straight out of the eighteenth century. Tongue-tied and stumbling when first trying to communicate, I’m sure I made a verbal leap straight to the Middle Ages. For both of us, that initial trip was indeed just a beginning, and we have returned to Paris over our lives for pleasure, for work and for love, because one never outgrows the ability to be besotted with Parisian charms. Black spoke of taking her son there as a child, and his complaints at being dragged to another museum. I remember the cry of my own children, “no more churches,” and their happiness with an expedition I sent them on. Like Aimée Leduc, who wears a Tintin watch, they were great Tintin fans. So without adult supervision, I sent them armed with a map, Metro tokens, some Euros and their middle-school French to the Tintin bookstore. A ragged collection of taped-together Tintin books in French is still kicking around my house. The ripples of similar experiences sparked by Black and her detective go on and on. I, too, have written a novel, if not a mystery, based on early experience in Paris, That Paris Year. 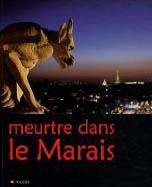 But whereas I’m just working on a sequel, Black is the author of an acclaimed series of murder mysteries set in various Parisian neighborhoods. Her twelfth, Murder at the Lantern Rouge, is just out. I can’t wait to read it. And to check out that little-known part of the Marais, where it is set, when I go with our group of travel writers to Paris in September. What a fun blog post, Joanna! I figured you of all people had to be riveted by Cara's talk ... although I can't imagine anyone in the room felt otherwise. I was transfixed! You had me laughing out loud in a few lines here.